If there’s one thing I love, it’s a good mystery. I love puzzles. Growing up, I was desperate for a good mystery to happen in my own life – I only ever got as trying to pick the lock on the wardrobe in our Door County hotel room. But at least I got to live vicariously through Nancy Drew. She’s a super-cool super sleuth that has managed to stay relevant for decades. 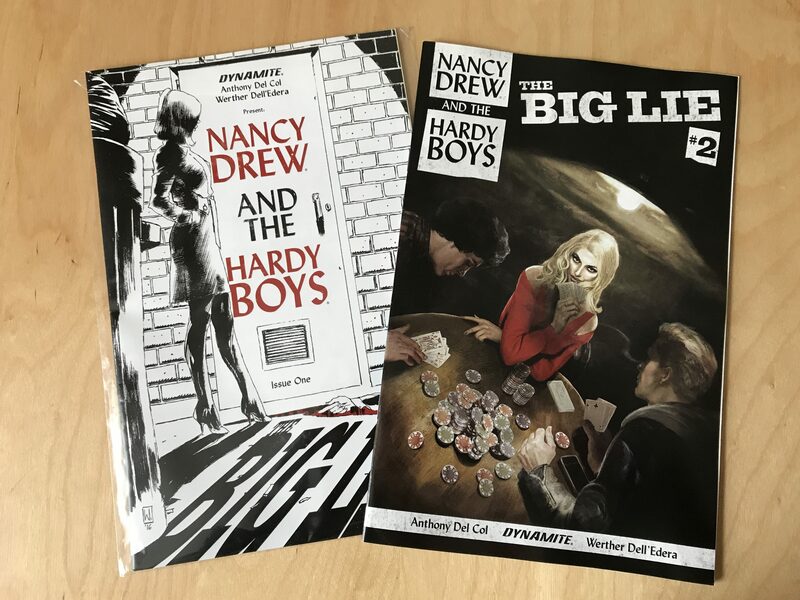 So a couple weeks back when I saw Dynamite Comics was coming out with issue #2 of their Nancy Drew and Hardy Boy series, I felt bewildered that I had let this pass me by. Well, the good thing anyway is being able to read to issues back to back with the third arriving already in early May. I like mysteries, but I’m pretty greedy and impatient with them, too. Bayport not as sunny as it used to be. Frank and Joe’s dad, Fenton, is arrested for police corruption for taking bribes from criminals. Though those charges ended up being invented, and their father released, the damage had been done. Depressed, their father shot himself. But the police aren’t convinced and bring the boys in to be questioned for the murder of their father. They disappeared for an hour during a party the night of their father’s death, leading to suspicion that they killed their father themselves. That premise leads the boys into their next mystery. One filled with classics: clocks, secret stairwells and a girl named Nancy Drew. Only this story is quite a bit darker from the days of the blue and gold hardback books. The Big Lie is darker than the old stories, but it certainly is attention-grabbing. And the style done by the team at Dynamite is absolutely spot-on for creating that crime noir feel. I mean, look how gorgeous these covers are! I really enjoy that the comics switch between all three names, being told in mostly voice-overs. In issue two, it’s revealed that Carson Drew is the prosecutor in Fenton Hardy’s case, making Nancy’s position difficult. But the girl begins to do her own digging to help out the boys. And I love it. I really hope this series continues with a great mystery, because I could use a good mystery to get wrapped up in. But so far, two issues in, Del Cole and Dell’Edera are doing a fantastic job.